After Walt Disney's death in 1966, the studio still had a few films in production and pre-production to get them through the next couple of years. These films would still be marketed the same as when he was alive, with "Walt Disney Presents" above the title. 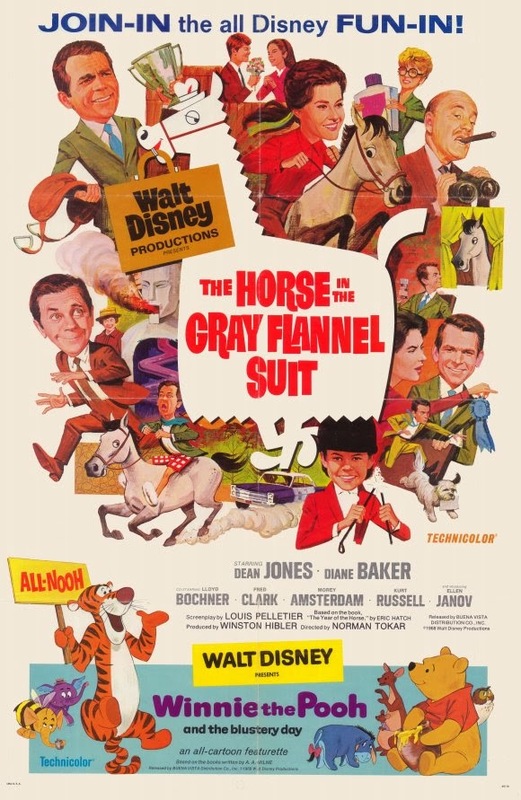 The first film marketed a different way, with "Walt Disney Productions Presents" was The Horse in the Gray Flannel Suit, based on the book The Year of the Horse by Eric Hatch. With the studios' biggest star Dean Jones attached, they assigned Norman Tokar to direct. The two worked together on The Ugly Dachshund. The screenplay was adapted by Louis Pelletier, who did several Disney films before it including Follow Me, Boys!. Winston Hibler, famous as an animation writer and animal film producer, filled producer duties. Disney's rising star Kurt Russell appears here in his third Disney film, shortly before taking Dean Jones' title as the biggest star at the studio. Alan Hewitt returns to the studio, having appeared in both Absent-Minded Professor films, who would be paired with Russell in the upcoming Dexter Riley film series. Character actor Norman Grabowski makes his final Disney appearance here, best known as the dumb jock in the Merlin Jones series. After an animated credit sequence, we are introduced to advertising agent Fred Bolton, who is working on marketing a digestive pill called Aspercel. While at work, he receives a big bill for his daughter's horse riding lessons that makes his head spin. After the boss is unimpressed with their campaign, he gives the team 24 hours to create a new one. When Fred picks up his daughter Helen from her lessons, he settles the bill with her pretty riding instructor, who had suggested to Helen that if she had her own horse, her riding would improve and she could compete in big races. In a stroke of insanity, he pitches the idea to his boss of having a show horse named Aspercel to subliminally bring the product to a higher class market, which gets him promoted to vice president. After Helen loses the first competition, Fred takes advice from Ronnie, the brother of another competitor. He has Helen's instructor increase training to every day because if Helen and Aspercel don't make it to the finals in Washington, he will be fired. After hearing her father argue with his boss before a show, she gets under a lot of pressure even though she is consistently winning. When Aspercel runs away and Fred chases after him, Helen reports the horse stolen. Their ride turns into a police chase and Fred gets locked up in jail, but the story gets media attention which pleases his boss. When Ronnie arrives to take Helen on a date, she stands him up to practice and has an emotional breakdown under the pressure of competing. After finding out that Aspercel jumped a 7 foot wall during the chase, the trainer decides to enter the horse in the open jumper championship, which could land them bigger media attention. With the trainer riding, the pressure is off Helen. When Aspercel wins, Fred realizes he is in love with Helen's instructor and they get engaged. The Horse in the Gray Flannel Suit was released on December 20th, 1968, paired with the second Pooh short, Winnie the Pooh and the Blustery Day. It earned $3.3 million during its box office run, about half of what Dachshund earned and not quite a success. It premiered on TV in 1971 and was first released on home video in 1986. While the title and marketing suggest this is a zany Disney comedy, it actually has a lot more heart than what appears on the surface. There are also a lot of deeper themes, such as gender inequalities of the 1960's, the importance of family over careers, and the psychological trauma of children who support their family. The film offers fun, classic Disney charm with great performances from all of the actors. The only faults I can give it are inconsistent pace. It starts out fast paced and exciting, but quickly becomes slow paced once Aspercel starts competing. Many of the outdoor scenes were shot at Disney's Golden Oak Ranch. The title is a joke on a popular novel and film from the 50's called The Man in the Gray Flannel Suit. Fred's dog is named Herbie, possibly an intentional nod to the next Dean Jones Disney comedy, The Love Bug. The Horse in the Gray Flannel Suit is currently available on DVD, where it is presented in fullscreen. The original theatrical ratio was 1.75:1 widescreen. They used the VHS master from the 1998 release to make the DVD and there aren't any bonus features. The film is also available in a 4-movie collection of Kurt Russell films where it is paired with Now You See Him, Now You Don't, The Strongest Man in the World, and The Computer Wore Tennis Shoes.